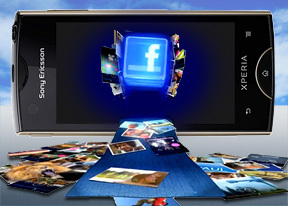 The Xperia ray’s visually customized phonebook can store extensive information about all your contacts. Info for each contact is presented in side-swipable interface that holds contact info, recent calls and more info from social networking services. The contact list can be sorted by either first or last name. There are two contact search options – a dedicated search field on top of the contact list, and an alphabet scroll to jump to names starting with a specific letter. And if a contact has accounts in multiple services, you can “join” their contact info to keep everything in one place. Their Facebook photos and interests will show as extra tabs. The Xperia ray held on to signal well and we didn’t experience dropped calls. Reception levels are good on both ends of calls, the earpiece is loud enough and there were no interferences whatsoever. The built-in secondary microphone is used for active noise-cancellation so calls are loud and clear even in noisy environments. Unfortunately, the Xperia ray does not support smart dialing. There’s voice dialing though (the quickest way to activate it is the dedicated homescreen widget). Thanks to the proximity sensor, the Sony Ericsson Xperia ray automatically disables the touchscreen when you hold it next to your ear during a call. We also ran our traditional loudspeaker test on the Sony Ericsson Xperia ray. Scoring a Below Average result, the ray isn't the loudest ringer around, so you might occasionally miss a call. More info on our loudspeaker test as well as other results can be found here. Hidden in the Sound settings is xLOUD, a feature that claims to improve speaker loudness. A quick test shows deeper sound, but we also used our digital noise/loudness meter. xLOUD made a difference of about 5dB when you sum up the tests – but with or without it, the Xperia ray scores Below Average (note, the results in the table are with xLOUD on). It's not just a straightforward increase though - it boosts lower frequencies, while high frequencies (and high frequency ringtones) remain mostly untouched.